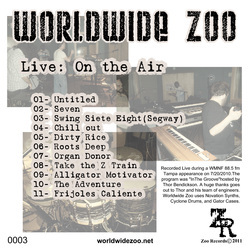 Worldwide Zoo pushes the boundaries of their craft, performance after performance, constantly finding fresh and appealing ways to speak to their fans. Very few instrumental groups have been able to channel so much musical variety into one definable sound and style that feels this good. Keyboardist Michael Zabrek, bassist Santiago Rodriguez, and drummer Jason Stander work together freely with almost telepathic precision and child-like imagination as they groove, swing, sizzle, and jive their way into your mind and soul. 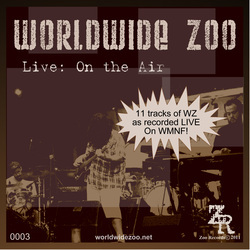 Worldwide Zoo's "Live On The Air" Now Available As FREE Download! That's right! Head over to the Multimedia page and download Worldwide Zoo's newest release FREE! This special "Live On The Air" performance is brought to you the way it was originally broadcast minus the interviews. All the raw goodness has been preserved for you to enjoy.